UMID or the Multi Purpose ID is the new compounded and integrated all-in-one service ID for government agencies namely, SSS, Pag-Ibig, GSIS and PhilHealth. With respect to all sorts of services by these offices, any member of any of the above agency can use the said identification card. With the Social Security System, there are designated kiosks all over the country where members who have the UMID may use it without the need to go fall in the very long line just to make personal inquiry on account details. Different services involving figures can now be determined with the use of the said kiosks in chosen SSS branches. You can inquire about loan payment, member contribution and more. Different government agencies included in the list of uses for UMID are PhilHealth, GSIS, SSS and Pag-Ibig. Using only one identification card, you can access, login, and check member data and information for any of the listed agencies above. You can get loan application status, monthly payment amortization and remittance status, loan payment, monthly contribution, download forms and more. 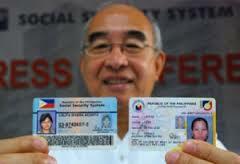 In the picture above is where you will see a comparison of the old SSS ID which has become just one of the included government agencies to be included in the service of the all in one ID called Universal Multipurpose ID. Using this compounded multipurpose ID for SSS transactions is easy. All you have to do is to swipe the card in any kiosk with some sort of an ATM machine that allows the latest SSS ID to be used for securing a database-based transaction wherein you can get any member related transaction information from loan, payments, monthly contribution amortization, housing loan payment and any static information need. But before anything else, if you still don't have this type of ID, you have to make way to apply for it in any designated SSS branch that allows application for this ID. Take note that not all branches of the Social Security System allows application of this particular ID so be sure to call their hotline telephone numbers first before reporting for application. The same thing goes when GSIS members want to use this multipurpose ID for doing any related transaction for a Government Service Insurance System member account. You have to apply first if you still don't have this ID through any designated GSIS branch that allows it. For the new kasambahay law in the Philippines, it is important to register your kasambahay to the new PhilHealth office as member. With this you need to download the application form below. For other concerns, you may visit the nearest PhilHealth office branch and make your inquiry there. You may also get a copy of any form you need there for your purpose. HDMF or Home Development Mutual Fund (Pag-Ibig) also have a share in enabling Pinoys of today use the compounded universal ID for the 4 major government agencies in the Philippines as listed above. If you want to make your inquiry regarding this new ID through Pag-Ibig, you may visit any nearby HDMF branch or go directly to an office you know. Different IDs have different procedures for application. Below is our own list of the chronological step by step ways you have to go through when applying for the multipurpose ID. In the meantime, you may download the respective pdf file application forms for a particular agency for universal ID using the links we have provided above for SSS, Pag-Ibig, GSIS, PhilHealth respectively. Just like the SSS login, to access any of your member static information, you will have to sign in to your account. If you don't have one yet, do sign up and confirm the link to be sent to your used email address. After confirming your account creation, you can now login to your dashboard. Below is our guide for that matter. Step 1. Go to the GSIS website homepage here – http://www.gsis.gov.ph/. Step 3. In the middle of the card, there is a box. Enter your ID number which can be found just below your eCard name. Step 4. Hit / press enter.